This week is a little special for me: Michael's on spring break from school and he also took the week off from work. So I get to have my boy home with me all week!! Which is awesome but also means my productivity is gonna be minimal. It just always is when he's home. We get stuff done but things for him or with him, not so much the stuff I usually do when he's gone. I guess this is my way of saying that um I don't know if I'm going to have recipes for you next week? Maybe? We'll see?? Regardless...if I don't-these brownies will MORE than make up for it! They are PHENOMENAL. 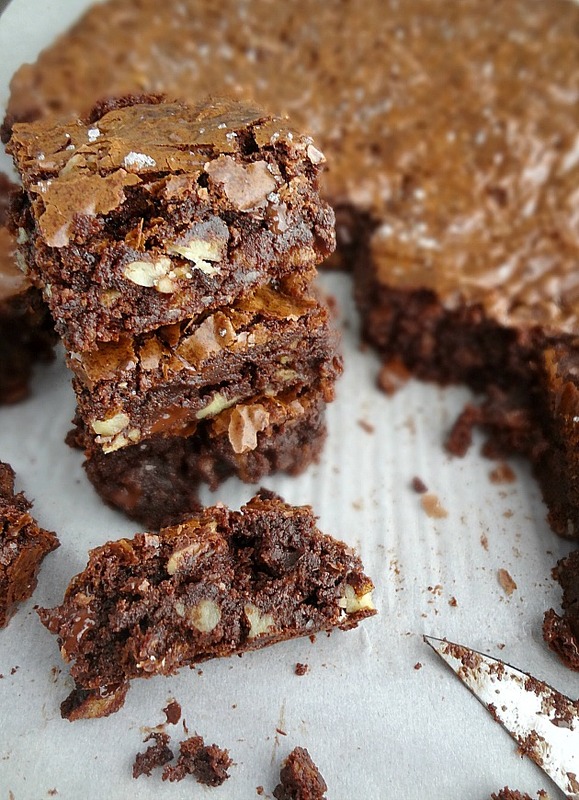 Warning: these brownies are not for the faint of heart. They are very rich. The recipe uses 4 sticks of butter and 6 eggs--that equals a lot of decadence (also this recipe makes A LOT of brownies. So take that into account). I highly suggest freezing some brownies for later. And sharing with everyone so that they are in awe of you and your baking prowess. 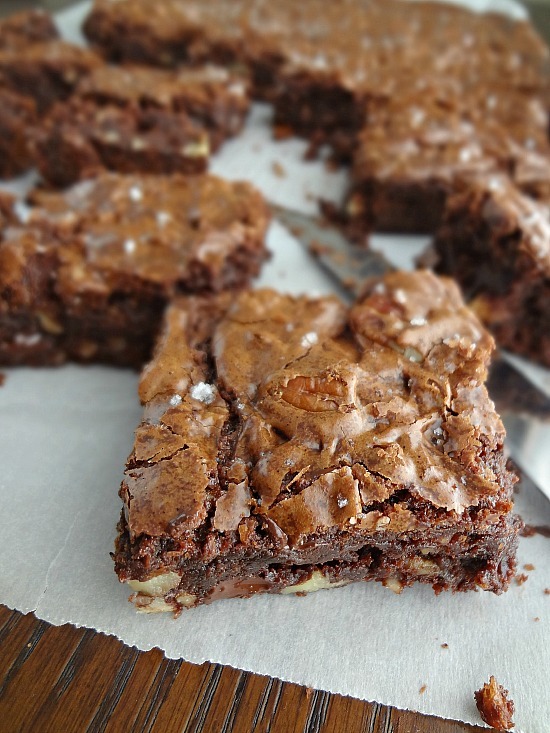 Flavor: A LOT of browned butter means a lot of browned butter flavor, plus a lot of delish dark chocolate, toasted pecans add to the entire thing and then some sea salt on top brings everything together. Serious indulgence here, my friends. Serious brownie perfection. They even have the sought after crackly tops! 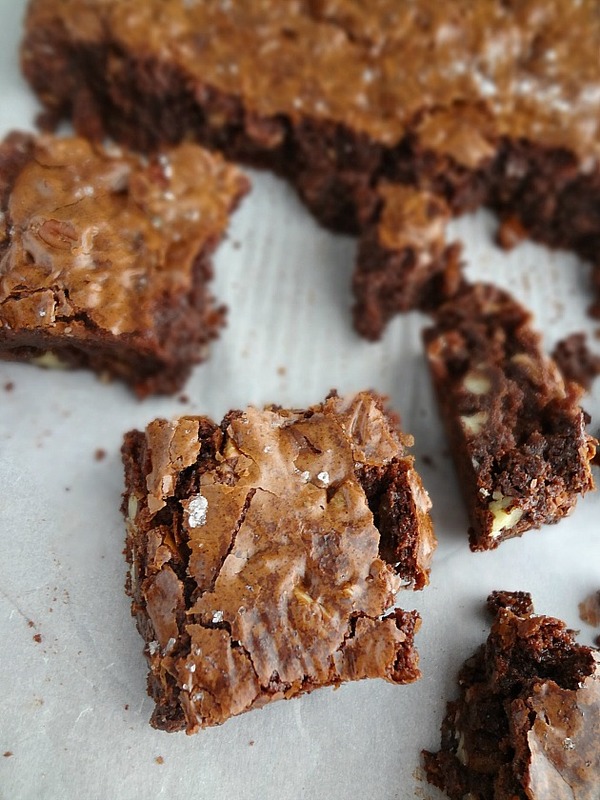 These shall go down as one of my favorite brownie recipes-EVER. You will be blown away, forreals. Makes one half sheet pan (approximately 30 large brownies). Preheat oven to 350F degrees and line a half sheet pan (12x18x1 inch baking sheet) with parchment paper o(leaving enough overhang to help you lift the brownies out of the pan after baking). To brown the butter: Melt butter in a saucepan over medium heat. Whisk constantly as the butter foams and eventually little brown bits form. Immediately remove from heat. Place a medium-large heatproof bowl with the 22 oz. of dark chocolate chips or chopped chocolate over a saucepan of simmering water (creating a double broiler and making sure the water does not touch the bottom of the bowl) and stir until the chocolate is almost completely melted. Pour the browned butter into the bowl with the chocolate (making sure to get all the browned bits) and stir until completely melted. Set aside and let cool until it is comfortably warm (I put it in the refrigerator to speed up the process a little). In a large bowl whisk together the eggs, coffee, vanilla, and sugar. Stir the cooled chocolate mixture into the egg mixture. Sift the flour, baking powder, and salt into the large bowl with the rest of the ingredients and stir until just combined. Using a rubber spatula, gently fold the pecans and chocolate chips into the brownie batter until evenly incorporated. Pour the batter onto the prepared baking sheet and use the spatula to smooth it out. Sprinkle with sea salt over the top. Bake 30-40 minutes, until a toothpick inserted into the center comes out mostly clean. Let cool completely and then cut into 30 squares. Store leftovers in an airtight container at room temperature or in the refrigerator for up to 7 days or freeze for up to 3 months.